Recently, I went to a lovely bookish event held at the Barbican being billed as a 'revolutionary new concept of multi-media storytelling.' It was a really wonderfully and unique experience and I wanted to talk to you a bit about it today. The multi-media aspect of the event included first off, Neil Gaiman reading aloud from his book, The Truth Is A Cave in the Black Mountains. At the same time, a string quartet from Australia, FourPlay, accompanied the story with music and really evocative vocals. And together with the words and music, artwork by Eddie Campbell were shown on a massive screen and all three of these things blended incredibly well. I left this event with a massive smile on my face. 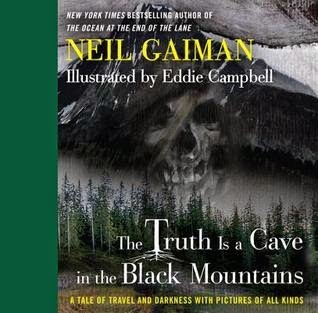 While The Truth Is A Cave in the Black Mountains was by no means a short book, the event was extended a bit by the fact that the first half included 3 or 4 of their own songs by FourPlay and also Neil Gaiman provided some anecdotes and read some short stories on different themes. After the book was read, he also sang some songs and there was a bit of an interview with Hayley Campbell. The music: I'm not a big fan of classical music at all. Mostly, I think because I have very little experience of listening or being exposed to it. I left this event thinking, 'wow, I'm really impressed' as well as thinking that I'd really like to take E and The Littlest to some sort of classical music event soon, mostly to show them what can be done with different musical instruments and to hopefully inspire them to create their own at some point. I really loved FourPlay's choices of music beforehand and I thought they had great chemistry together. I especially liked the different ways of producing music from each of their individual instruments including using the bow, plucking, strumming, tapping. I was really quite surprised by how much I enjoyed the music. Plus, the vocals that accompanied the story were really haunting and it added so much to my experience! The story: I'd never heard of The Truth Is A Cave in the Black Mountains before I came across this event at the Barbican. According to the leaflet that I was given as we entered, it was published recently by Headline. The book itself is a hardback picture book size and contains 74 pages. I really liked going into the event not knowing a single thing about the book itself. It was lovely to sit and listen to someone (Neil Gaiman!) read me a story. And Neil Gaiman has such a lovely reading voice. It's the story of a dwarf who goes on this journey to find the Black Mountains and it's also about revenge and is far darker than I expected it to be. I really didn't see some of the twists that happen beforehand and I love that about any book. 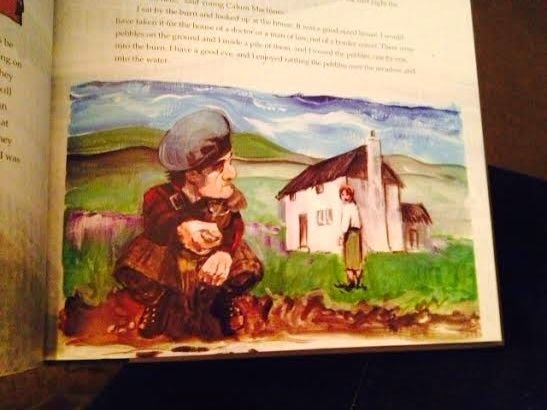 It's set in the Scottish islands and had a real Scottish feel to it. The illustrations: I have to say, the illustrations were my favourite part of this whole experience. I loved the different ways and techniques that Eddie Campbell (who previously worked on From Hell) used in order to illustrate this story - some of the artwork looked like comic book strips, others were more classically painted, some were roughly drawn, some more detailed. There were pencil sketches, silhouettes. Before the story properly started, Neil Gaiman explained that Eddie Campbell had produced a great number of newer illustrations specifically for the event so that everything flowed better and he was backstage making sure that the images changed in time to the story being read. As a whole, I thought this whole multi-media storytelling experience was incredible and I will definitely be looking out for other such events upcoming. I really hope you do as well.